Abstract - Today’s IT landscape is facing a distinct set of unique challenges and developments, as the world at large becomes more digital-centric and data-dependent. This article is excerpted from 7x24 Exchange International's Spring 2018 edition and is authored by Uptime Institute's Vice President of North America, Matt Stansberry. 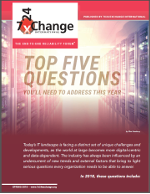 In the article, Stansberry addresses the five key questions data center owners and operators need to incorporate into their 2018 data center strategy, including the subjects of climate change, data center cyber security, edge computing, data center staffing and the increasing utility of the latest DCIM solutions for data center control and visibility.